Almagor organization calls for measures against arch-terrorist who advocated "armed resistance" from his jail cell. The Almagor terror victims’ organization on Tuesday called on Attorney General Yehuda Weinstein and Public Security Minister Yitzhak Aharonovitch to take legal and administrative measures against arch-terrorist Marwan Barghouti, following his letter in which he called for “armed resistance” against Israel. In the letter to mark 10 years since the death of PLO leader Yasser Arafat, Barghouti said that "choosing global and armed resistance" was being "faithful to Arafat's legacy, to his ideas and his principles for which tens of thousands died as martyrs." 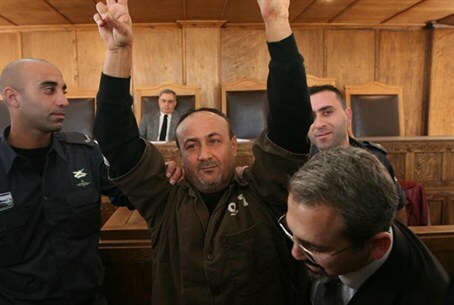 Responding to the letter, Almagor said that after being sentenced to six life sentences for murdering Israelis in terrorist attacks, Israel must make clear that Barghouti is not immune from further punishment and the imposition of additional penalties. "As an immediate measure, he should be isolated from any contact with outside visits and any contact with other prisoners, so that he is blocked from issuing inciting letters from prison,” the organization said. Barghouti, who is widely believed to have masterminded the second intifada, which exploded across Israel from 2000 to 2005, wrote the letter from his cell in Israel's Hadarim prison. Barghouti is widely perceived as a popular choice to replace Palestinian Authority Chairman Mahmoud Abbas, whose term in office expired several years ago. He recently accused the PA of neglecting the issue of terrorist releases and called for all Palestinian Arab terrorist groups to put his release on the top of the agenda.